Oh ! you have a little trouble overthrowing the Empire without me? 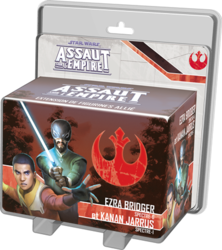 Bring a touch of loyalty and bluster to your Assault on Empire games with Ezra Bridger, Specter-6 and Kanan Jarrus, Specter-1. Fight alongside this dynamic couple in any campaign with the "Abuse of the Executive" mission. This expansion also contains new Command Cards and two unique Skirmish missions to play one on one.